I went to Tokyo Japanese Steak House in 3511 Ambassador Pkwy, Lafayette, Louisiana, USA. I had fun because it was Mrs. Mandy’s birthday and some kids were there. We played by the fountain until our table was ready. Then we sat and ordered our food and drinks. It took a bit long, but when I got my noodles, rice, and chicken it tasted delicious. I also ate my mom’s edamame and sushi. Fact, don’t put a lot of soy sauce on your food. But back to what I was saying, the hibachi chef does a lot of tricks, like putting his hands in the fire and making you catch eggs with your mouth. I did not like the soup. It looks good, but it was too hot and it tasted too much like mushroom. But overall I liked it, and my rating is four starts, and that’s that. The food tastes good but is different. I can’t remember the prices but mommy didn’t complain. They have things for kids. Thank you for taking the time to read this and I hope you go and enjoy it too, but now I have to go because is my bed time. Thank you again. Bye. Krit9c, I liked your review. Next time I am in Lafayette I will try it out. Thank you. Thank you Mrs. Aída. My mommy says you are her good friend. When you come to Lafayette I will give you a warm welcome and show you all the places. Mommy says you are up North so maybe when I go visit my Dad I can see you. I will talk to Mommy and Dad and tell you after. Great read! Thanks for this Kelon. I have been wanting to go and now I know what to try!! Thank you Mrs. Christina. I have other four places I went to that you must know. Please read my blog on Wednesdays or Saturdays, because when my mom has time I will post more. Thanks for the tip cousin, I can’t wait to try the soup. Keep up the reviews. 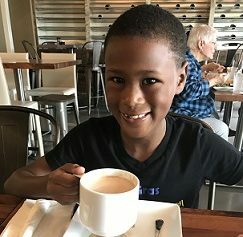 We have tons of restaurants in Lafayette and I would love to hear a kid’s perspective before I take my kids somewhere. Love it! Thank you dkedinger. I have been to other four places and will be posting about it in the next weeks. I hope you like it too. I’m sure your kids will love it. Kelon, Hector wants to go try it out now and wants you to come with us to help him decide what to get! Great job! Thank you Ms. Rachel. We would love to. Thank you Mila, I can’t wait to go there and taste all the foods.